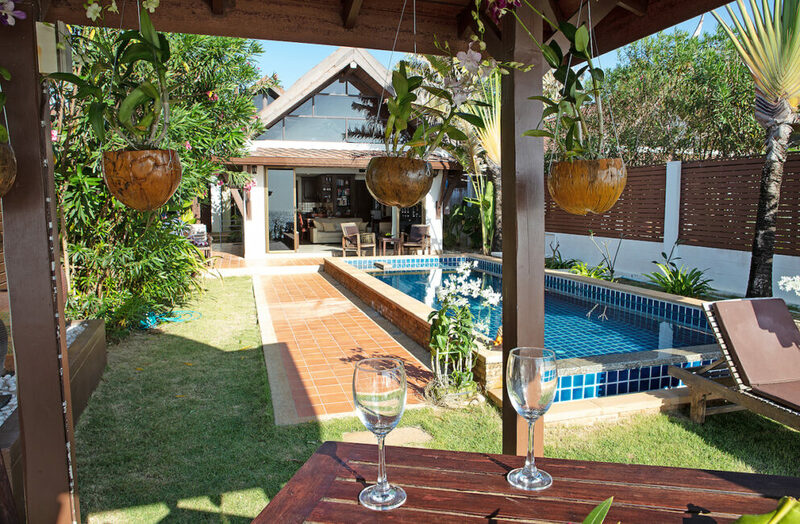 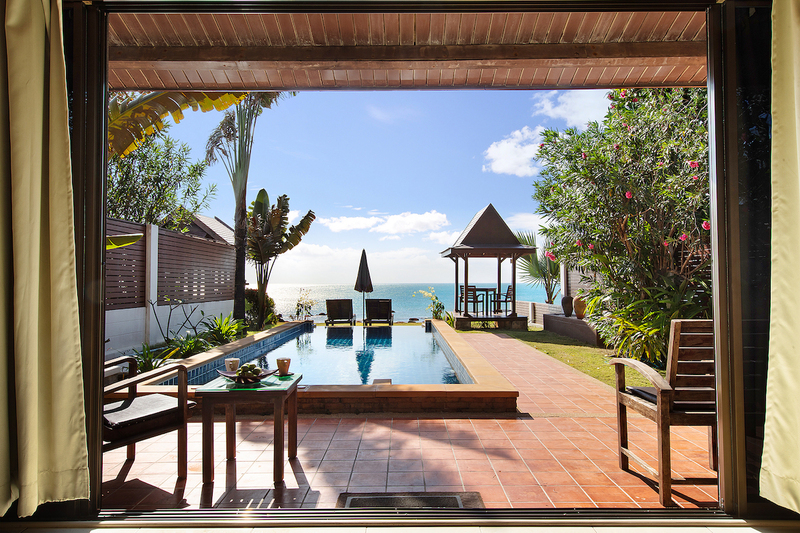 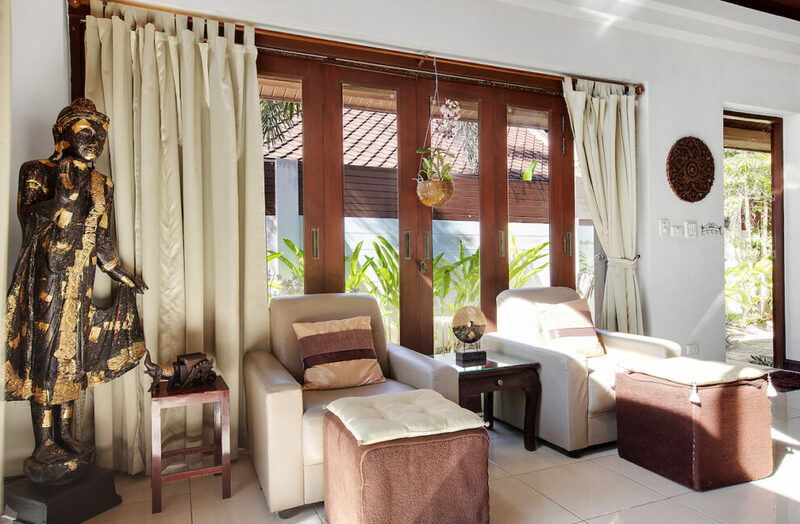 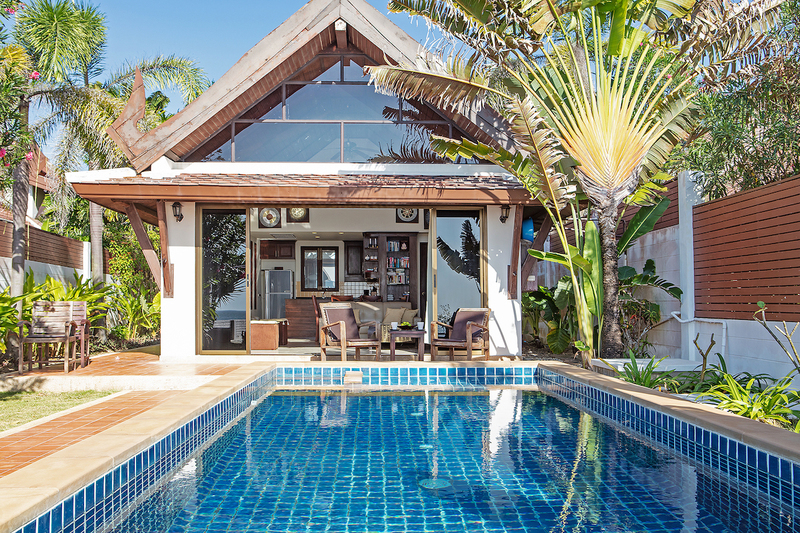 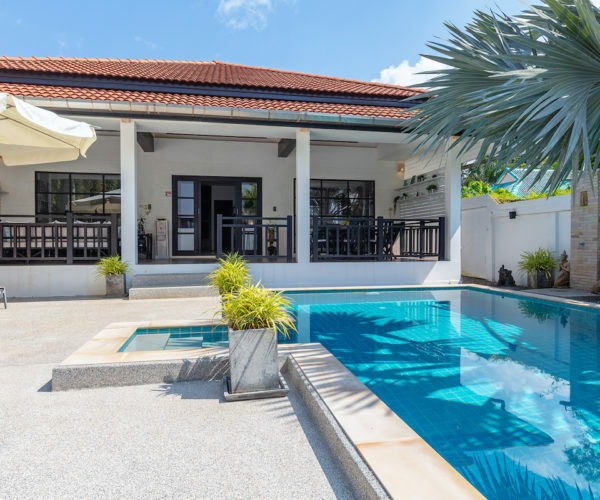 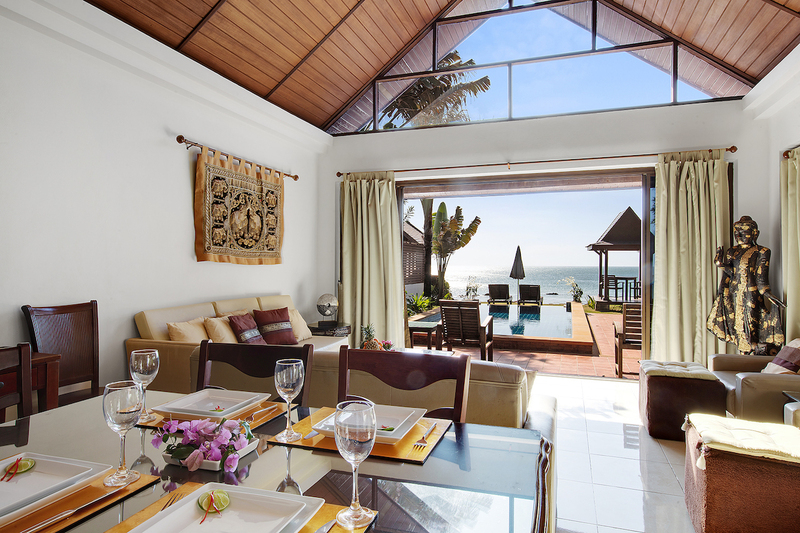 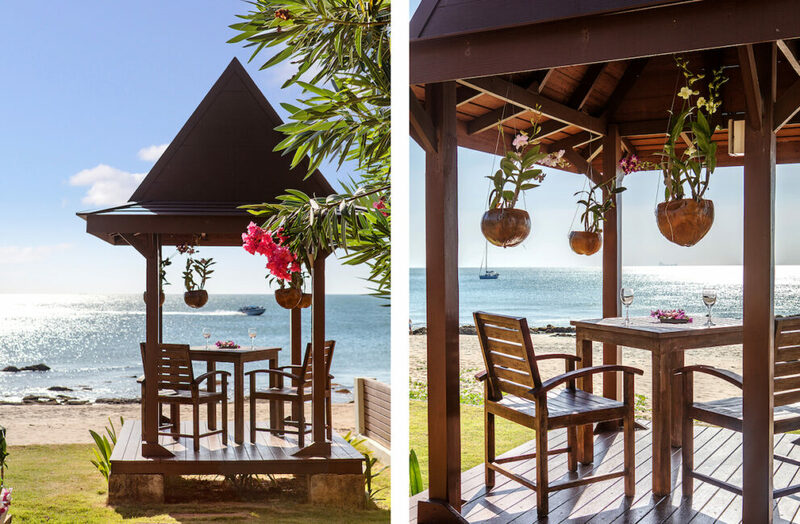 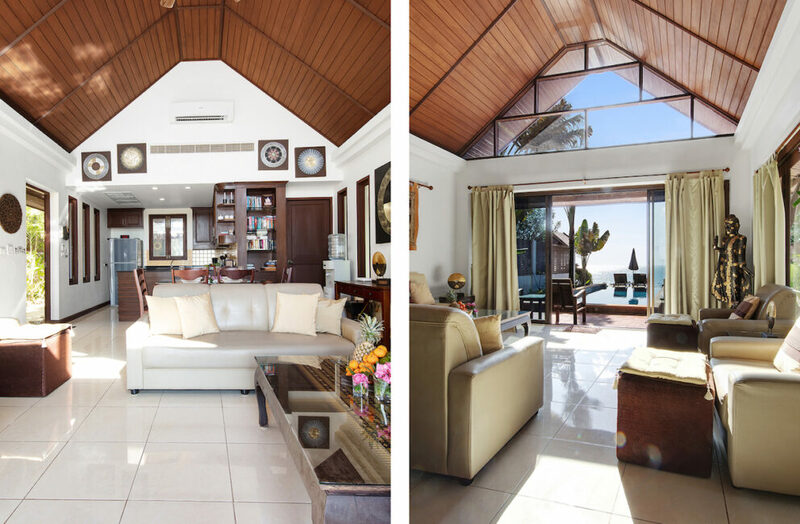 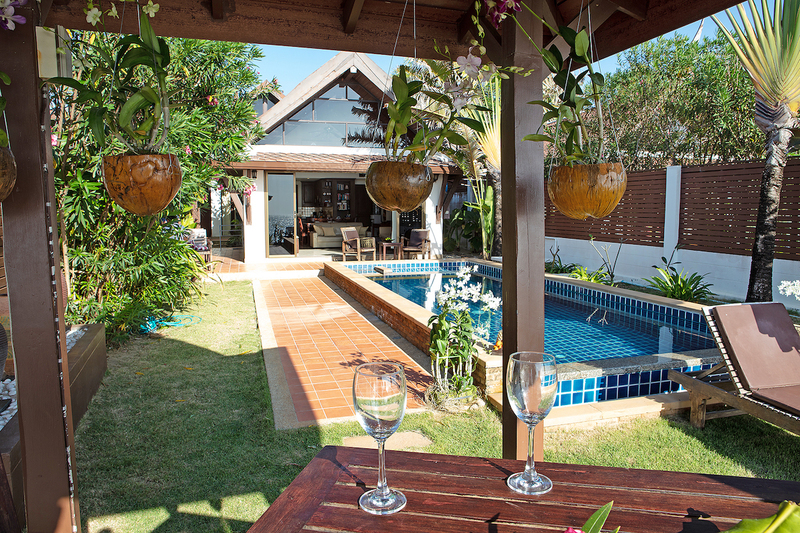 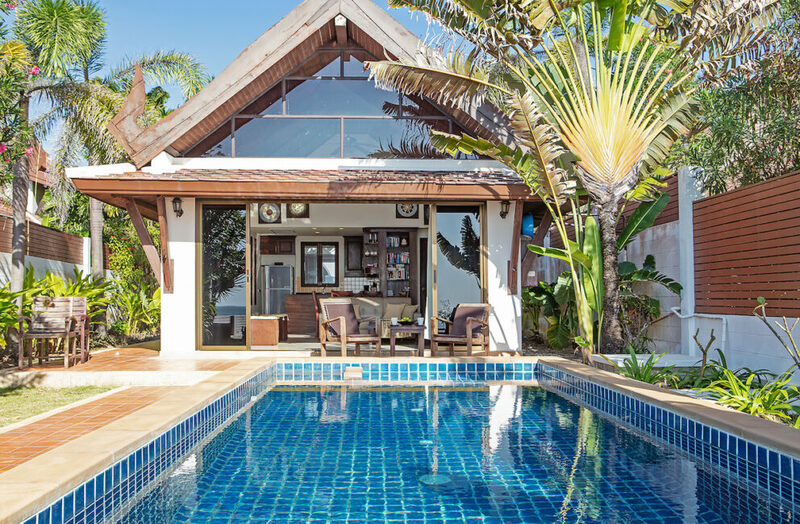 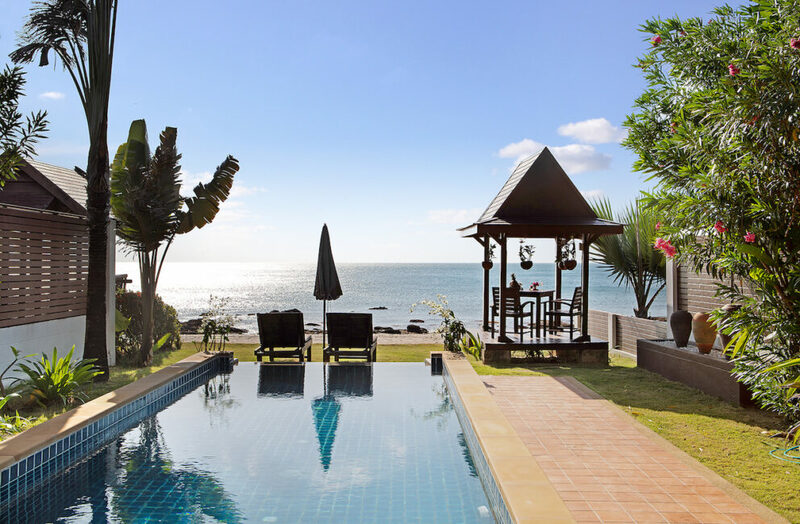 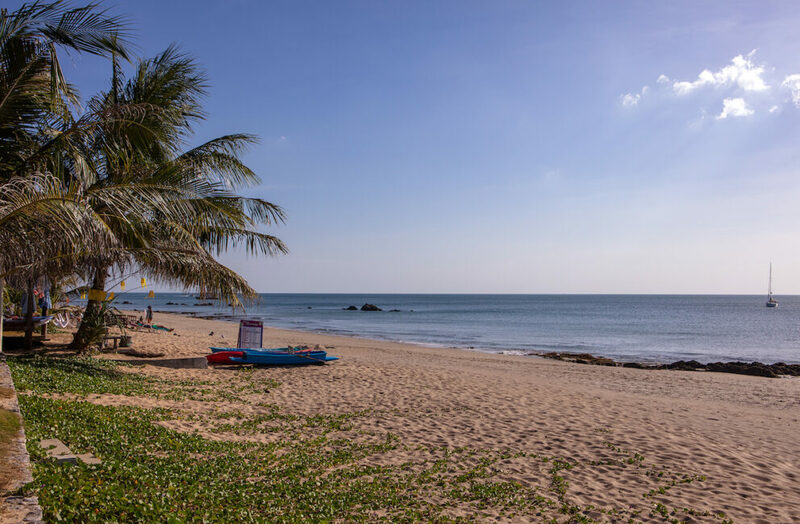 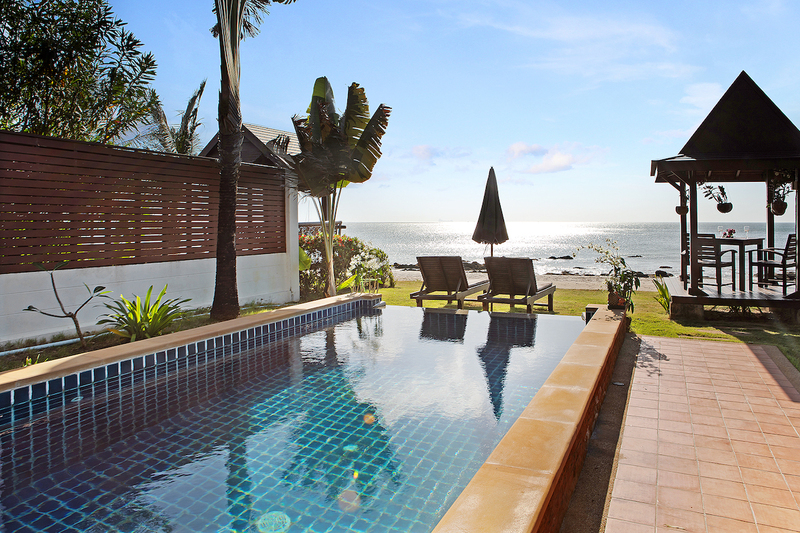 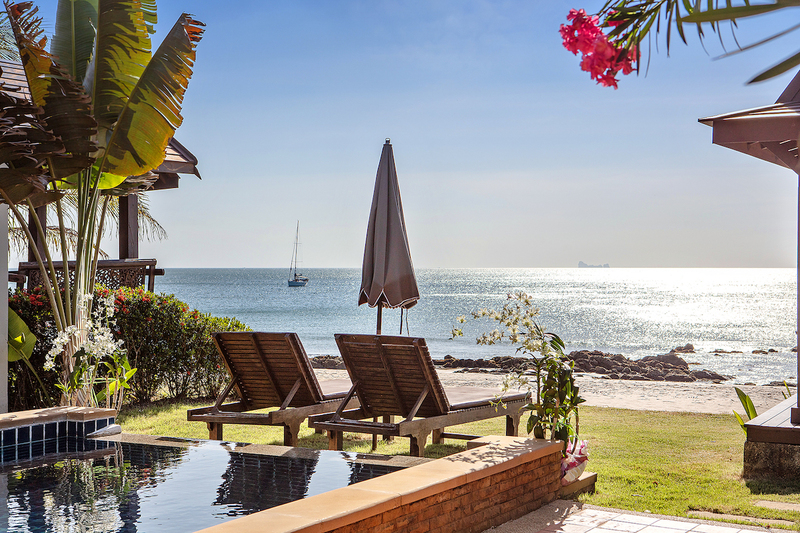 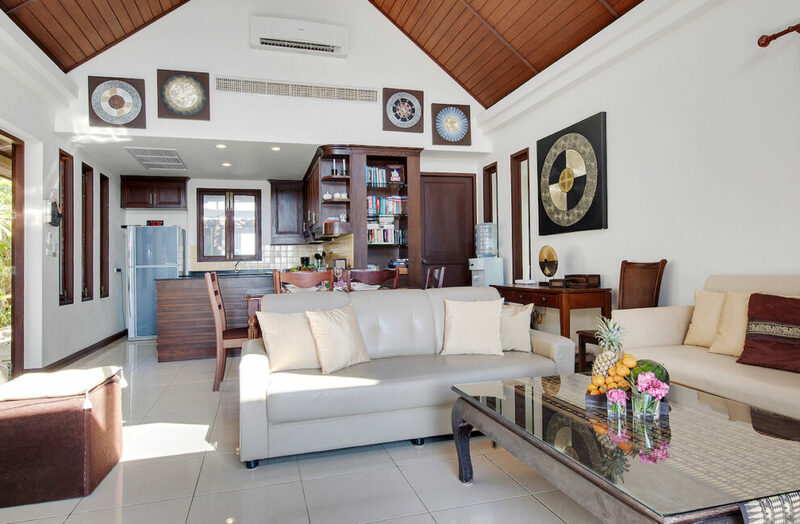 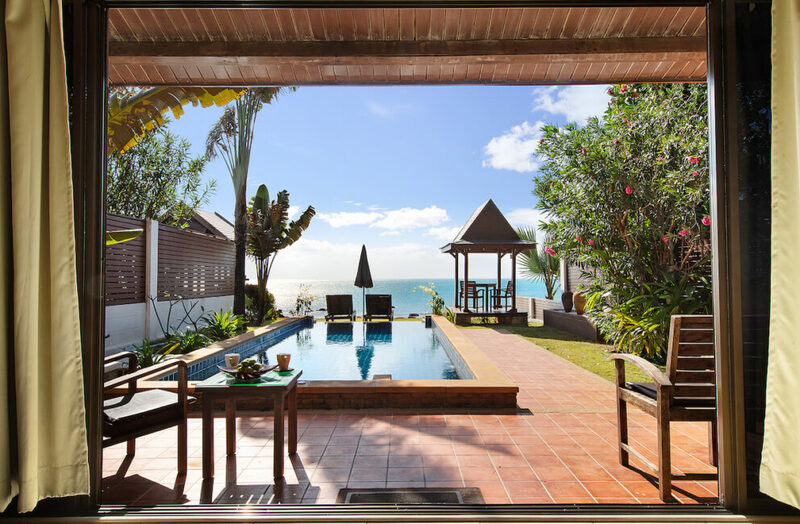 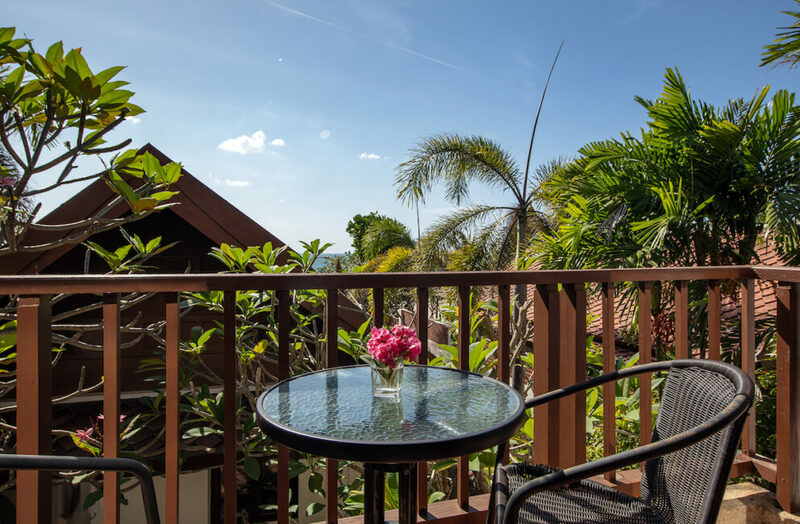 Beautifully situated on Klong Nin Beach front, facing the sunset, this two bedroom pool villa is the sought after get away! 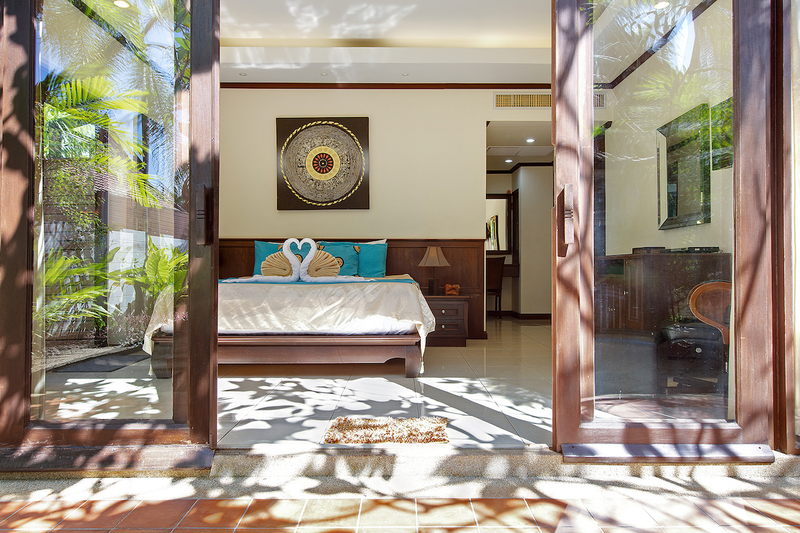 Perfect for the small family, the romantic couple or the creative person looking for an inspiring environment. 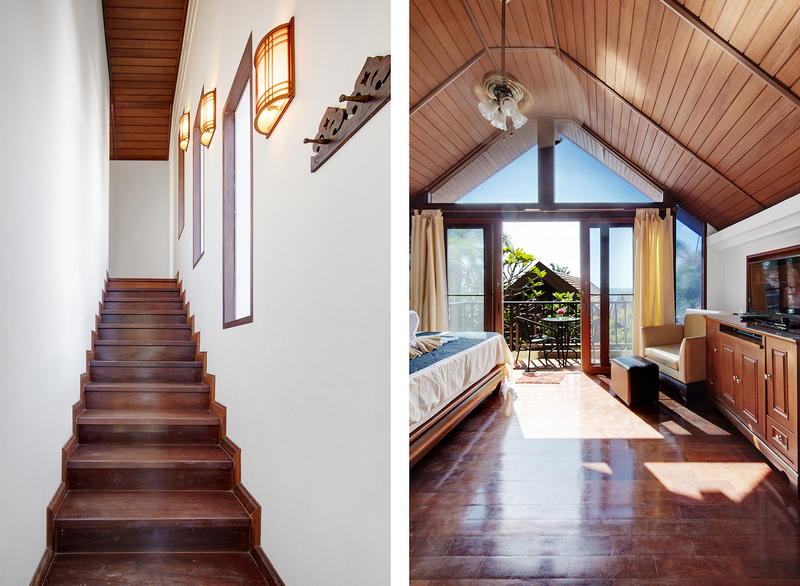 Two bedroom on two floors with separate entrances. 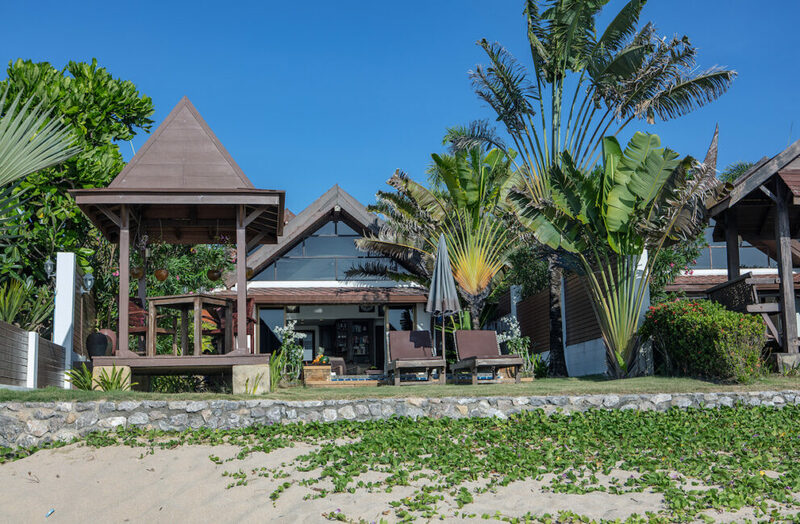 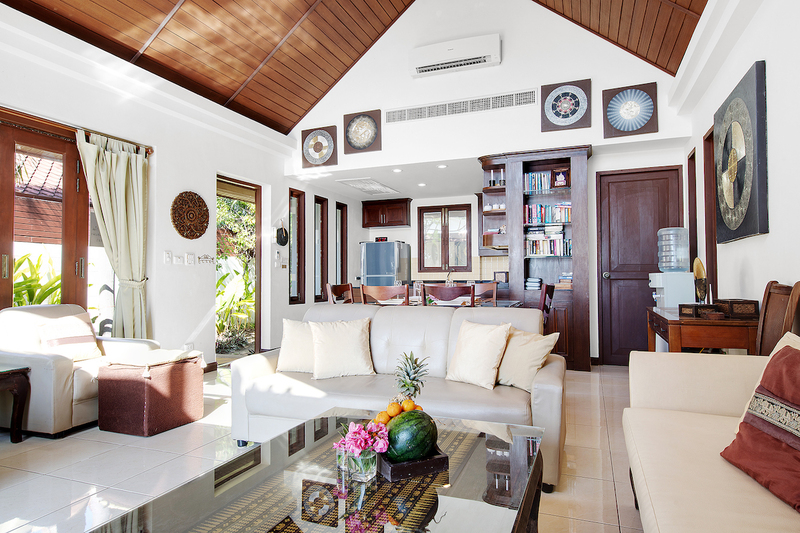 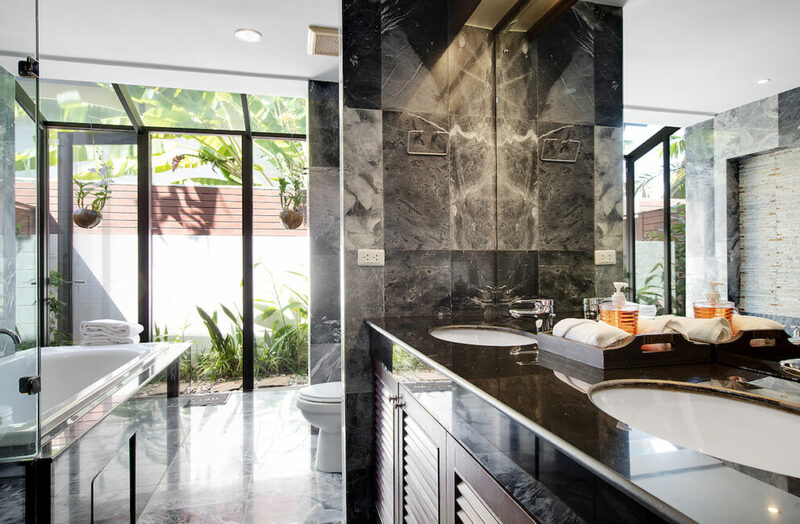 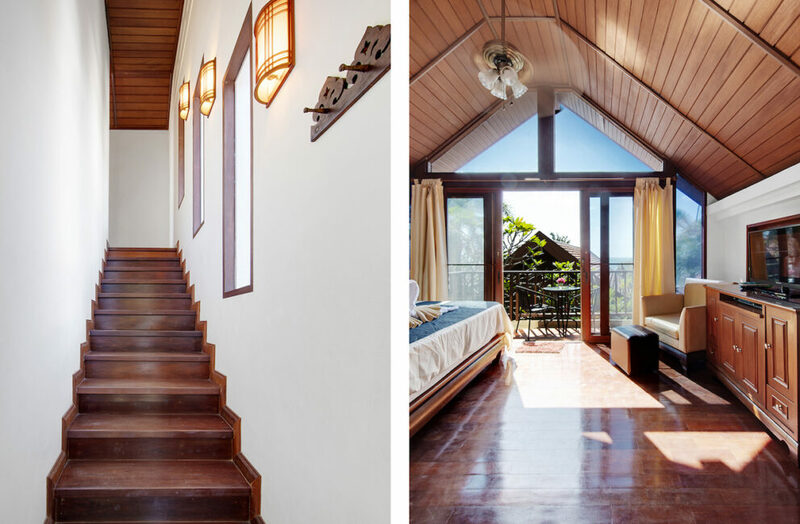 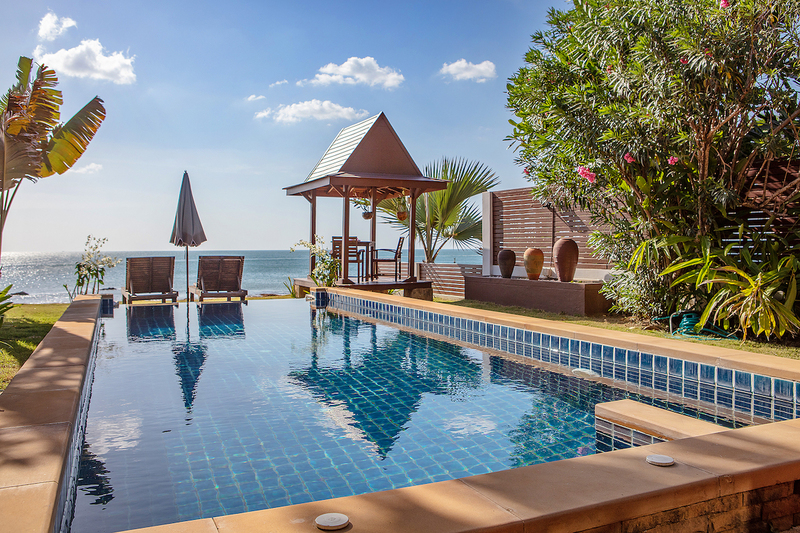 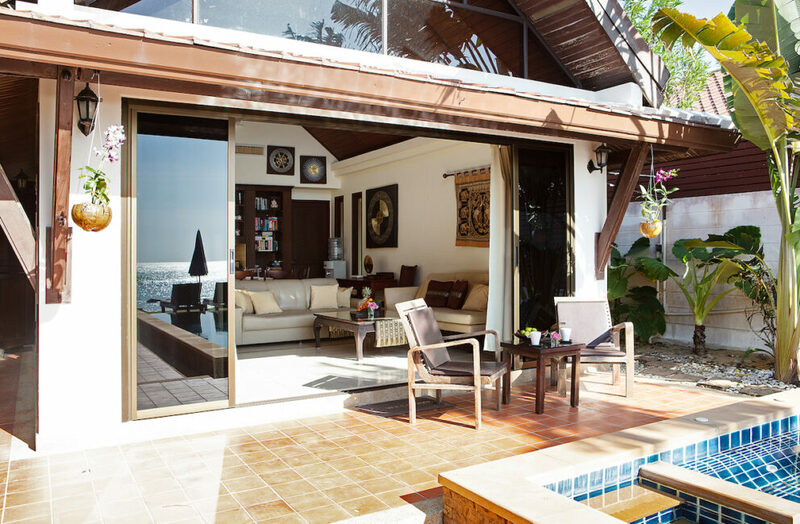 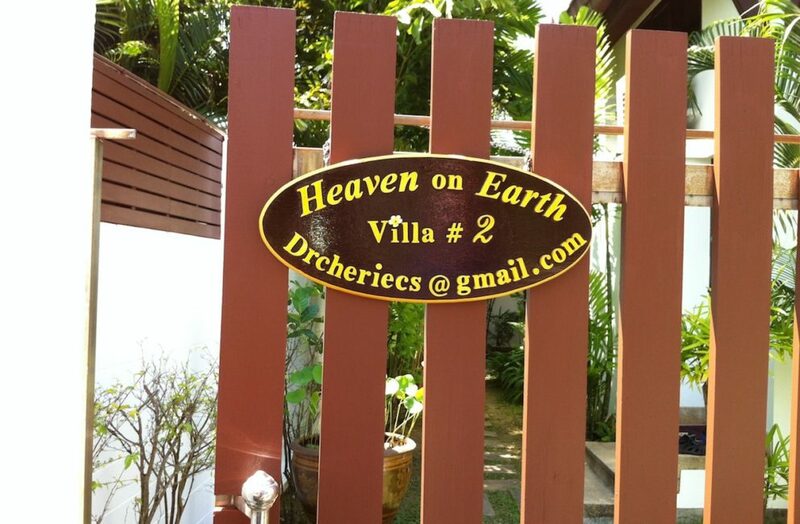 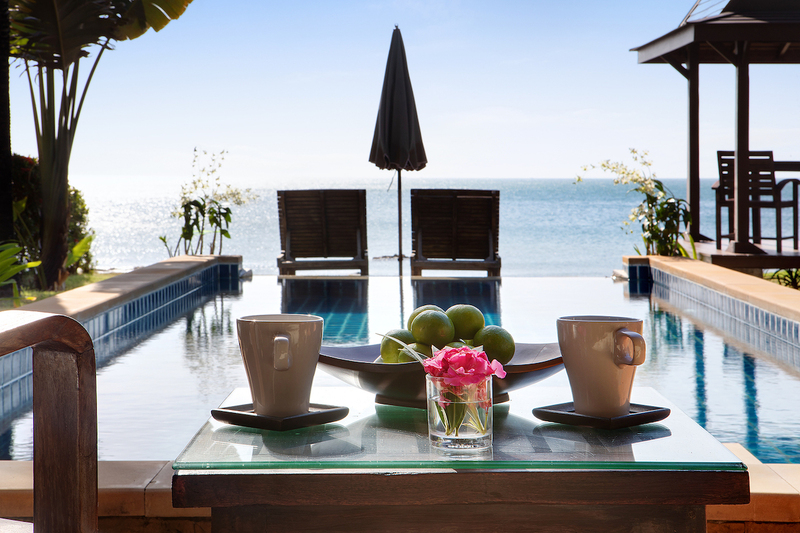 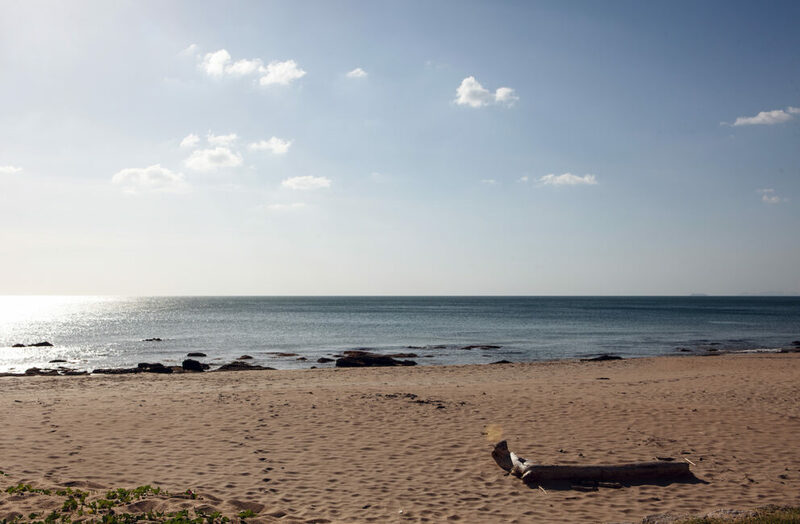 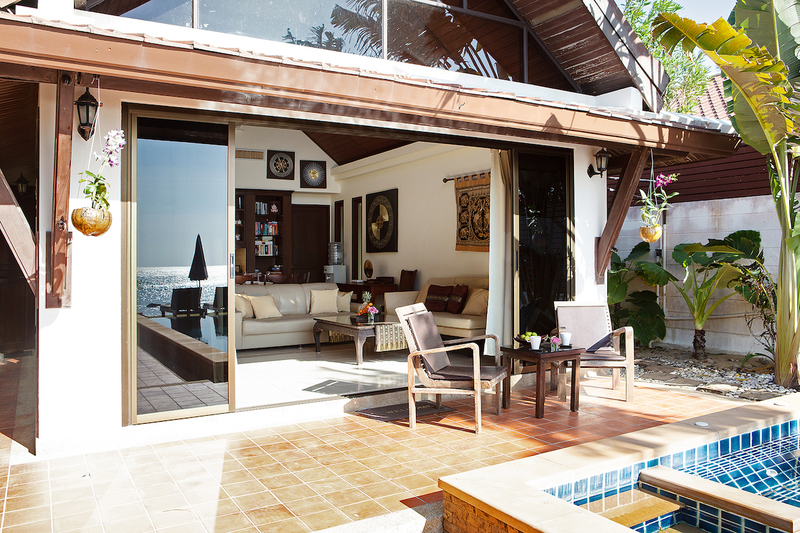 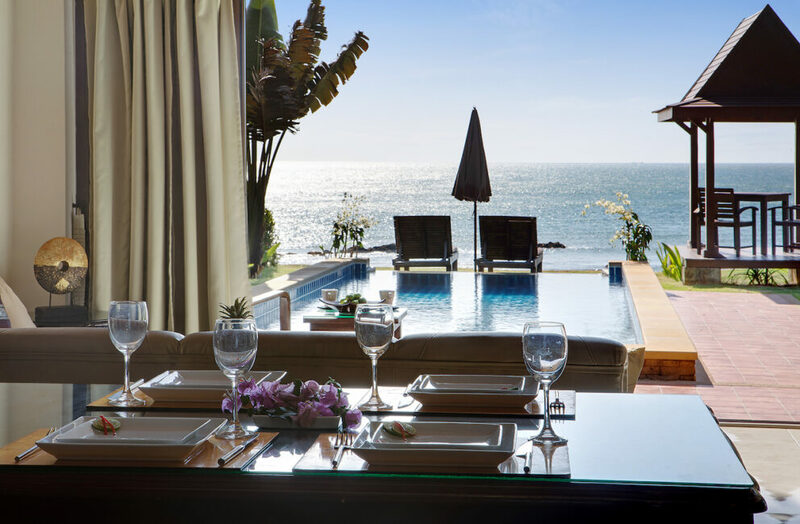 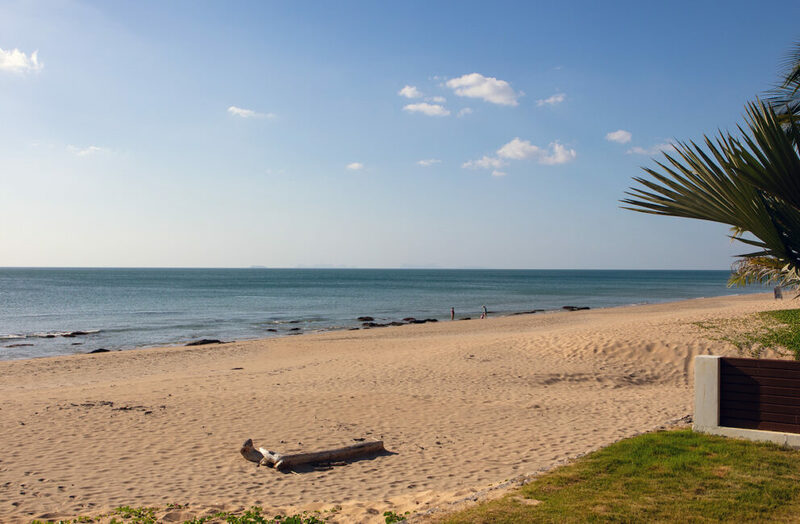 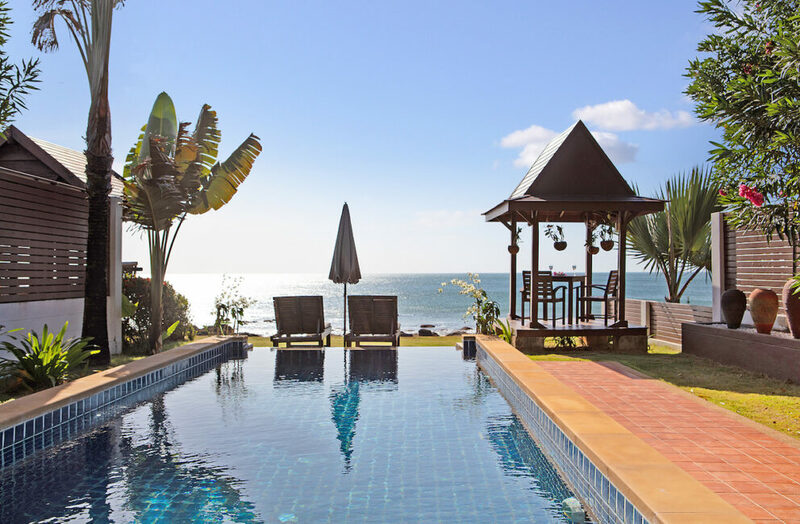 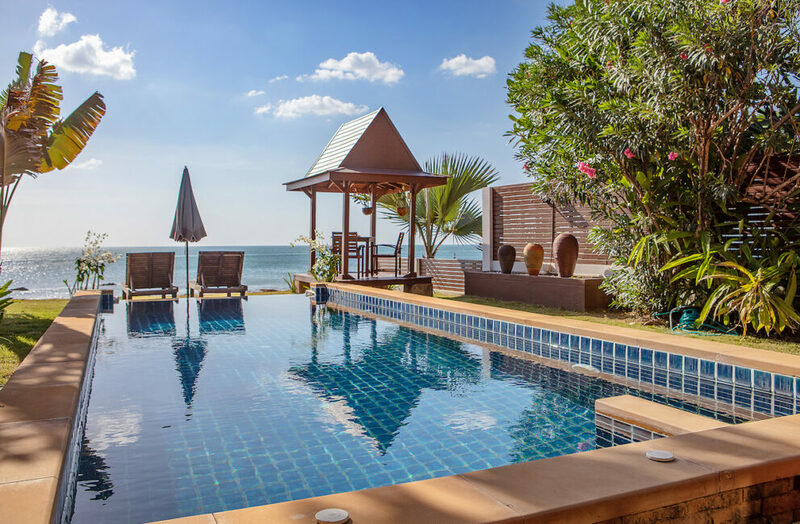 The beach front villa was built 2009 in an exotic Thai style decor and has an infinity pool overlooking the Andaman Sea – open and airy – yet providing privacy. 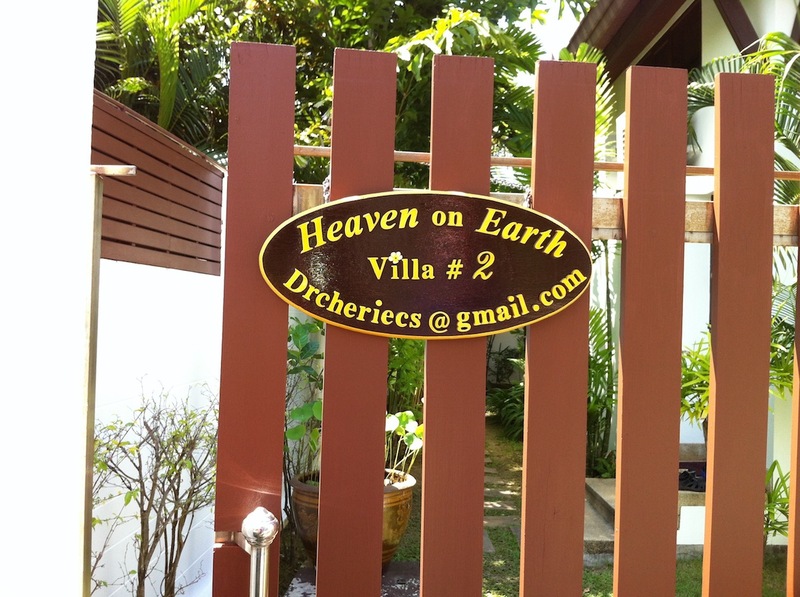 Going through the entrance gate you get to the first building where the bedrooms are located. 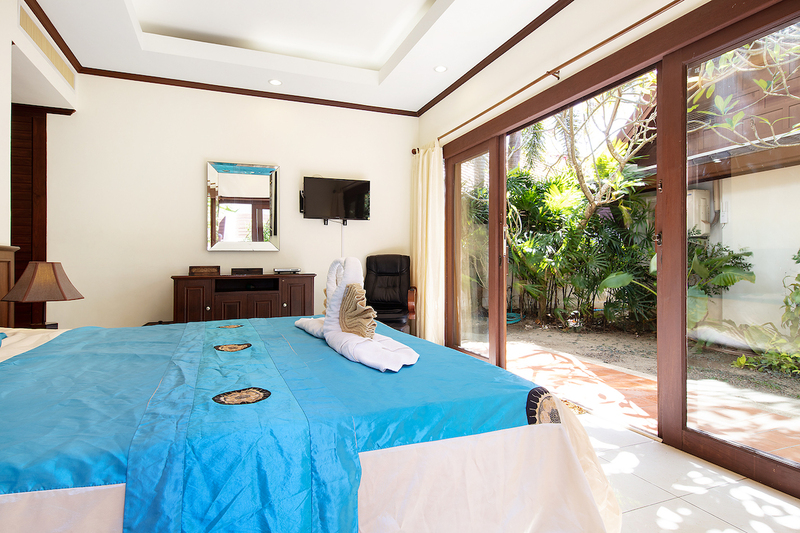 Bedroom 1 has a kings size bed with memory foam mattresses (Tempurpedic), wardrobe and air-condition. 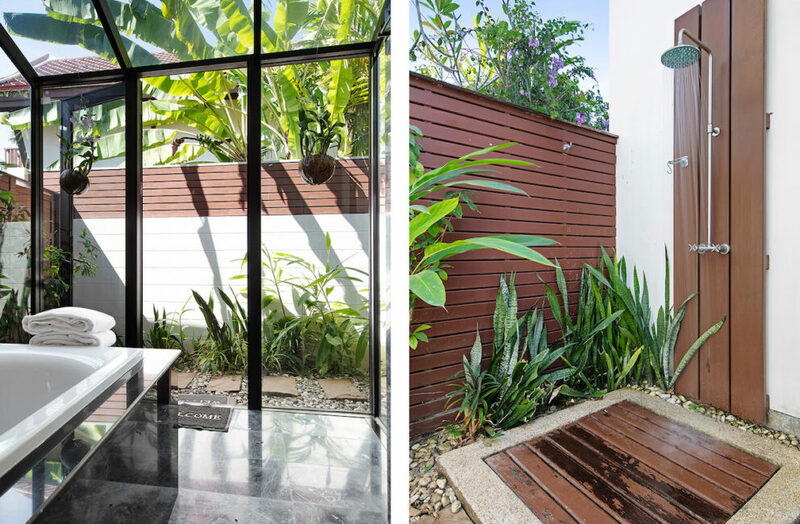 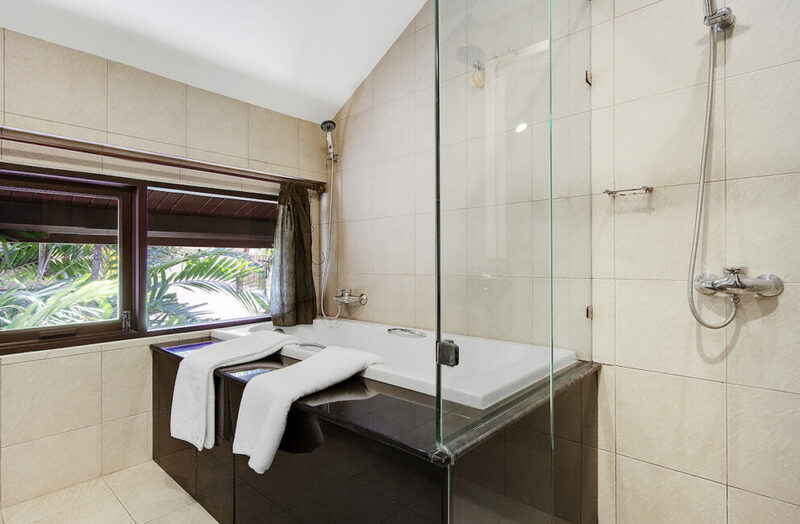 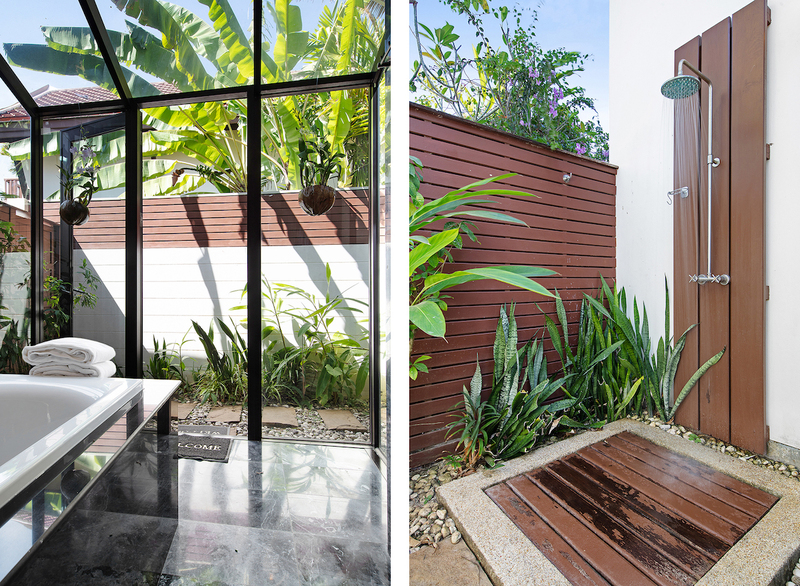 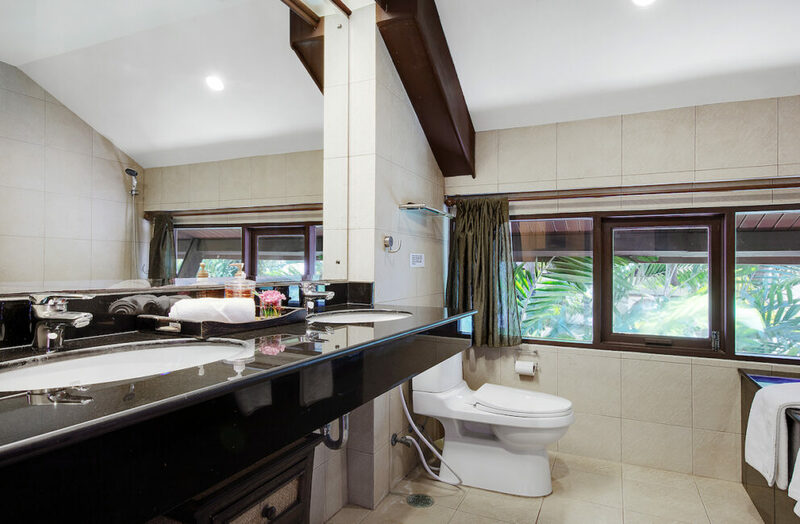 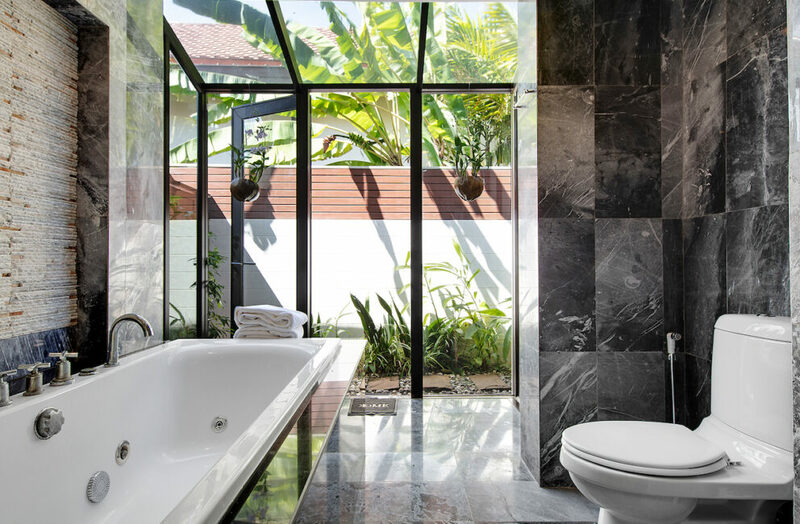 Access to en suite bathroom with shower, toilet and sink and access to an outdoor shower which can also be used from outside after pool and beach bath. 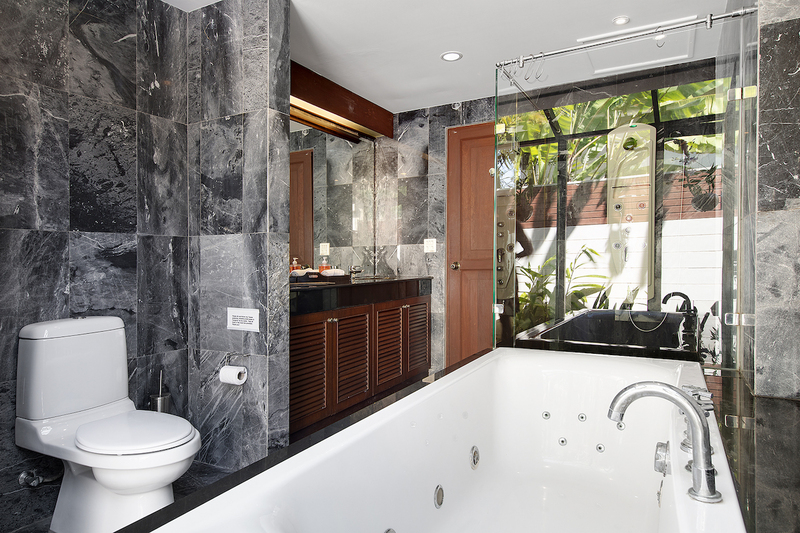 Please note that the tub showing on the picture is not working. 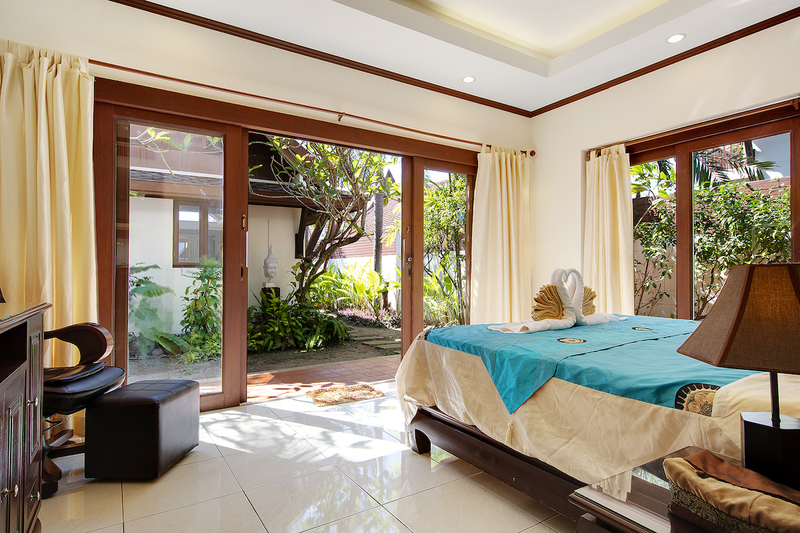 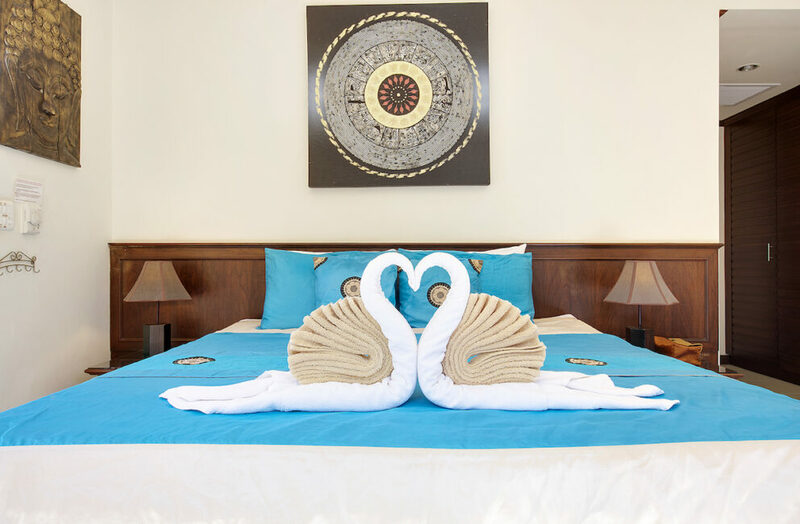 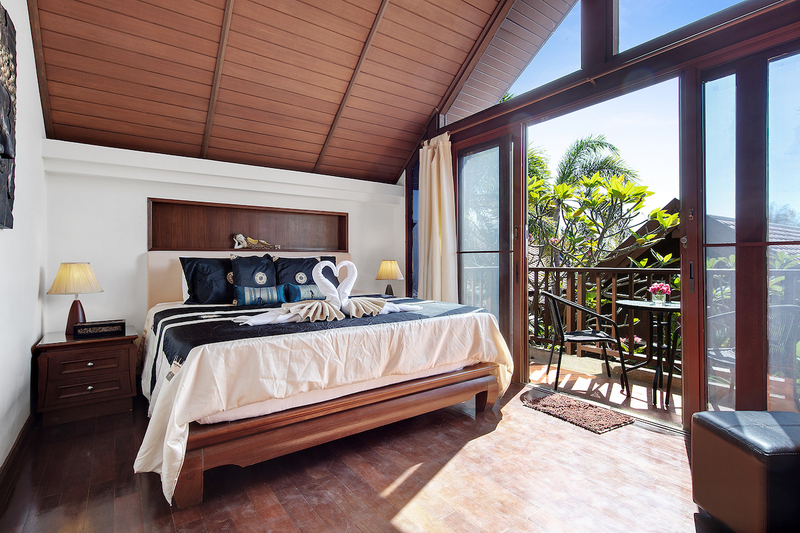 Bedroom 2 is on the second floor, with its private entrance from the side of the villa, contains a kings size bed with memory foam mattresses (Tempurpedic), wardrobe, ceiling fan and working desk. There is also a minibar convenient for keeping chilled drinks during night time if kitchen feels far away. 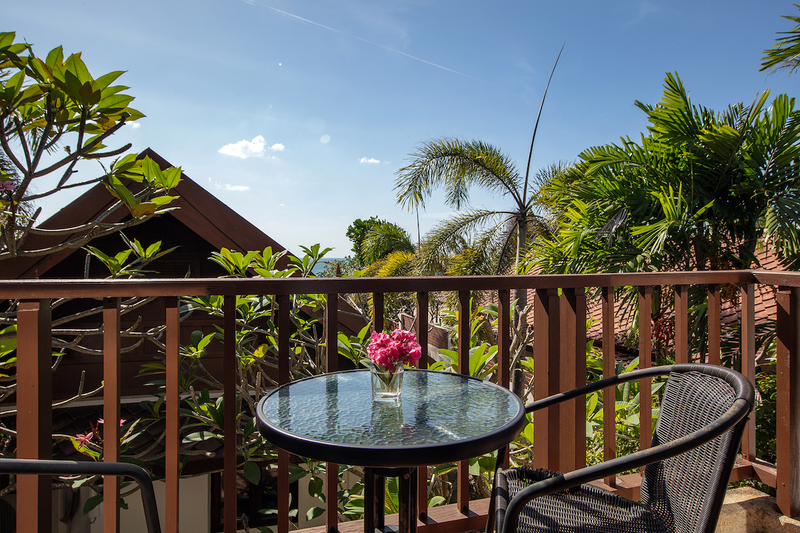 The balcony offers another good spot to enjoy the sunset and during evening, if you don’t want to use the air-conditioning, the sliding screen doors are recommended to keep mosquitos outside. 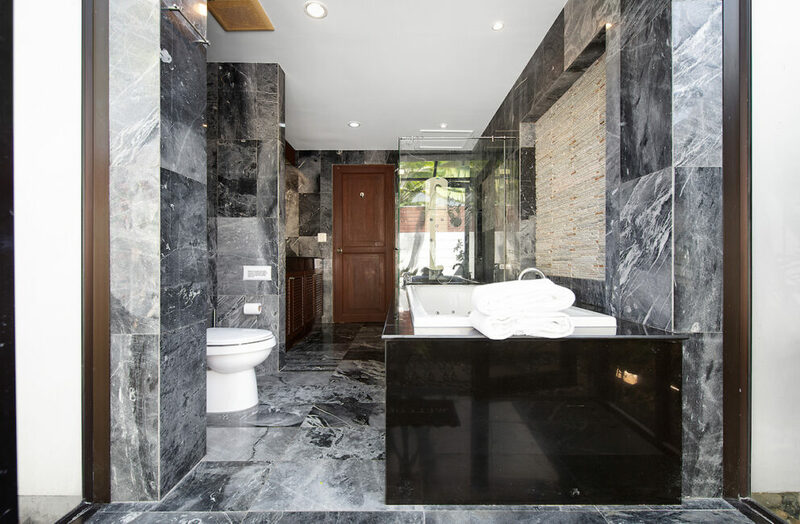 Private bath with shower, bath-tub sink and toilet en suite. 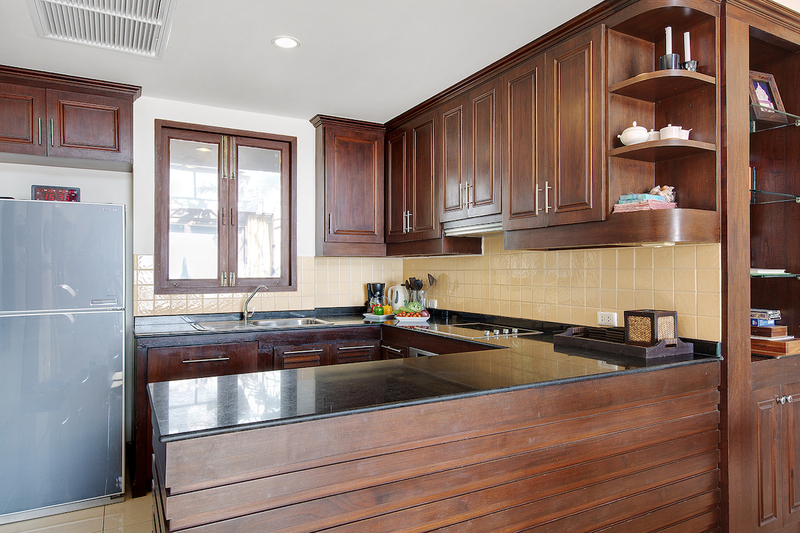 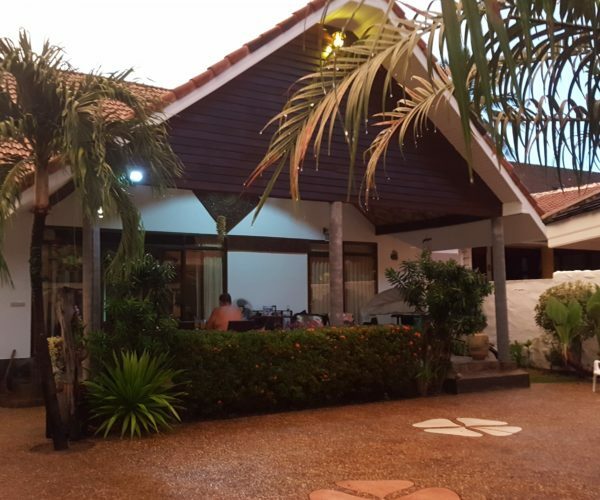 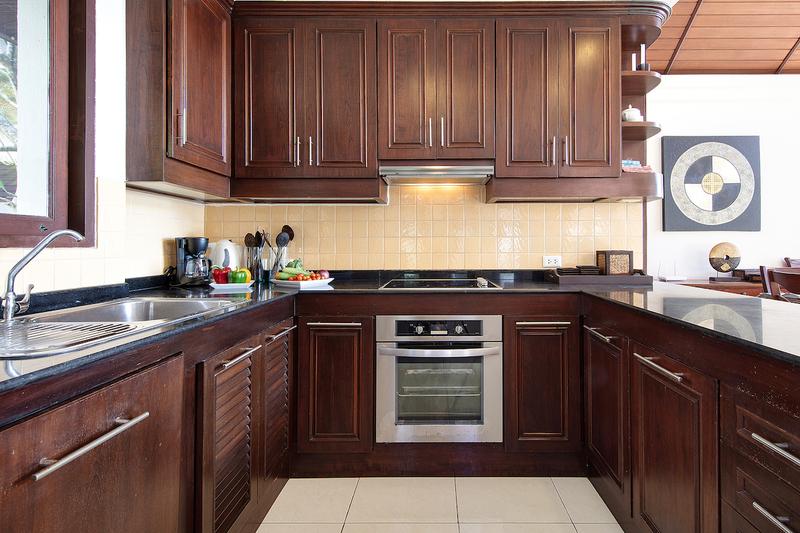 The second building is up beach front with an air-conditioned living room/kitchen equipped with fridge with separate freezer, electric stove, oven, microwave, dishwasher, cold water dispenser, various kitchen utensils and dining table. 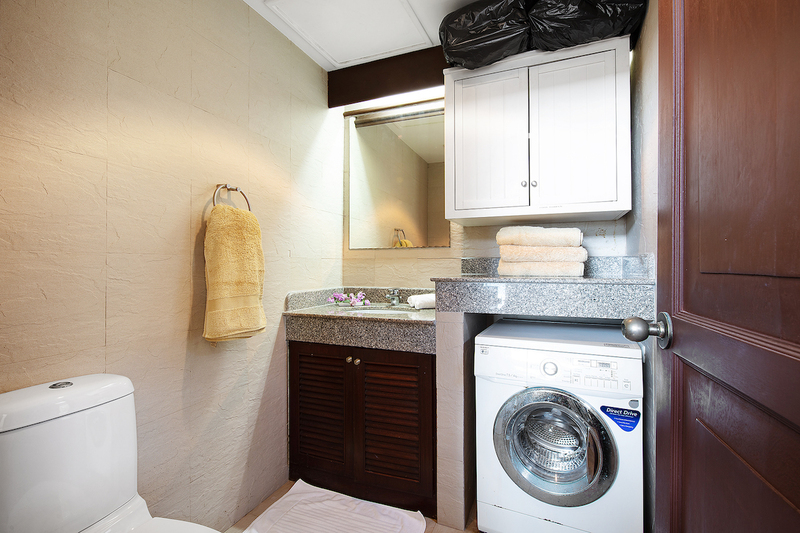 Bathroom with hot water shower, sink, toilet and a combined washing machine/dryer for your private laundry. 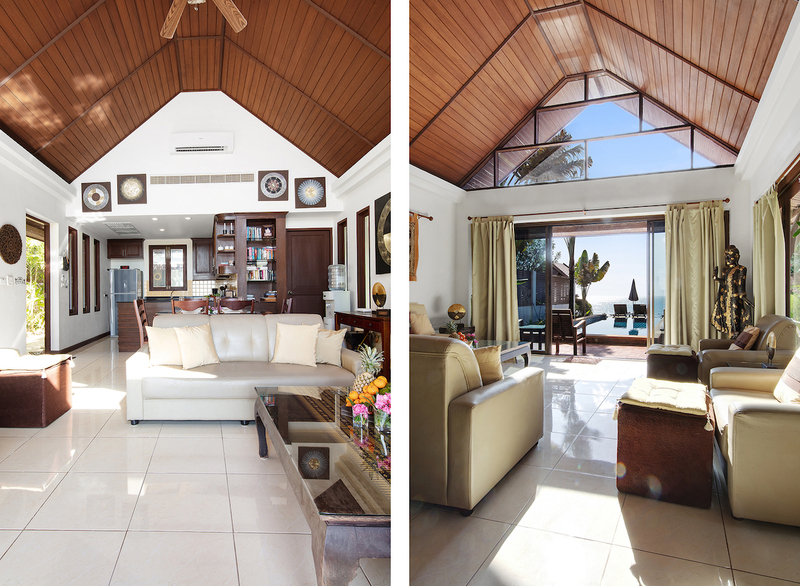 Living room with sofas and different spots to relax and socialise. 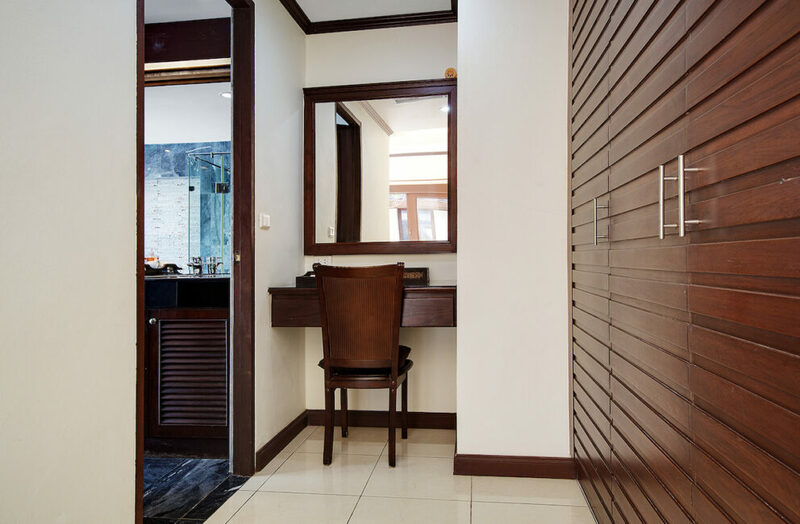 Working desk within reach as well. 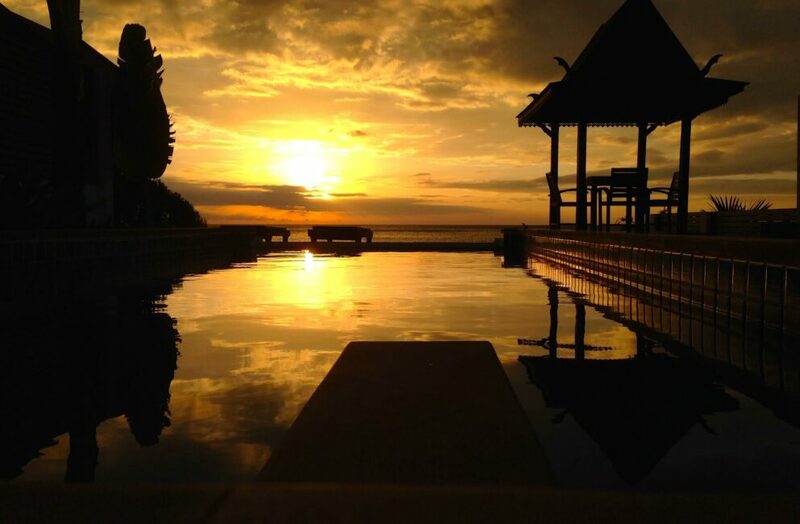 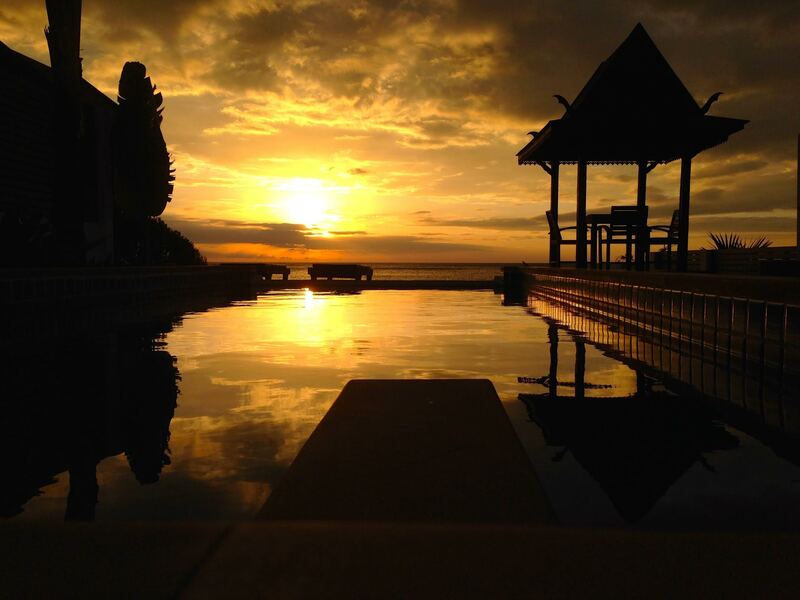 Around the infinity pool, there are two sun loungers. 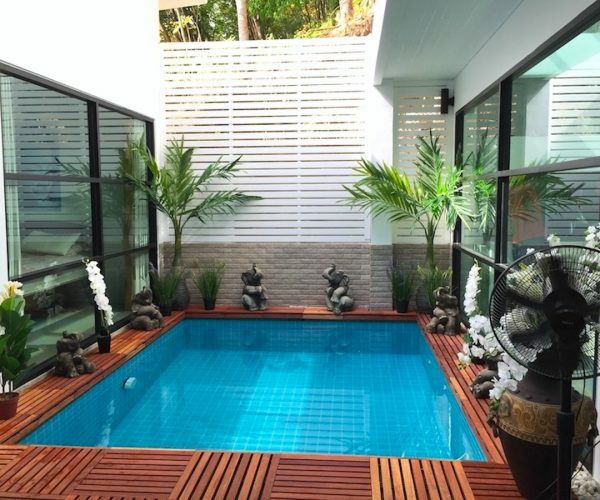 The pool has jet stream function that can be turned on manually to provide some extra resistance when practicing swimming exercising. 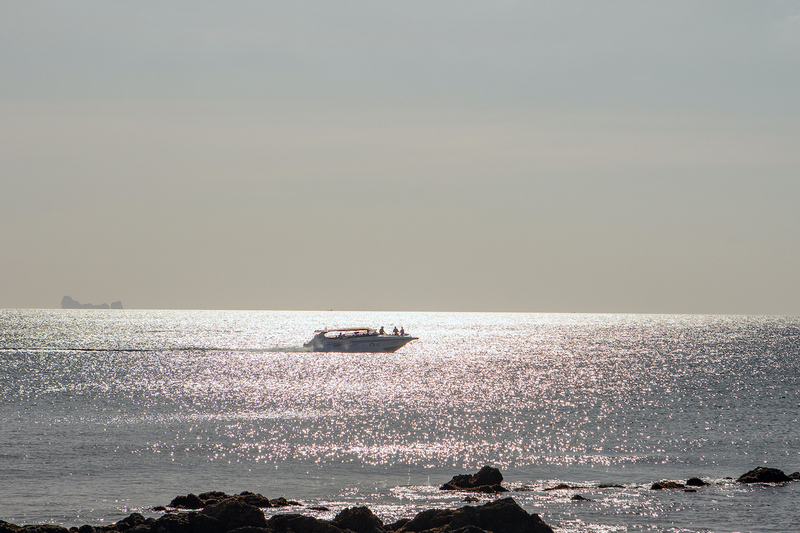 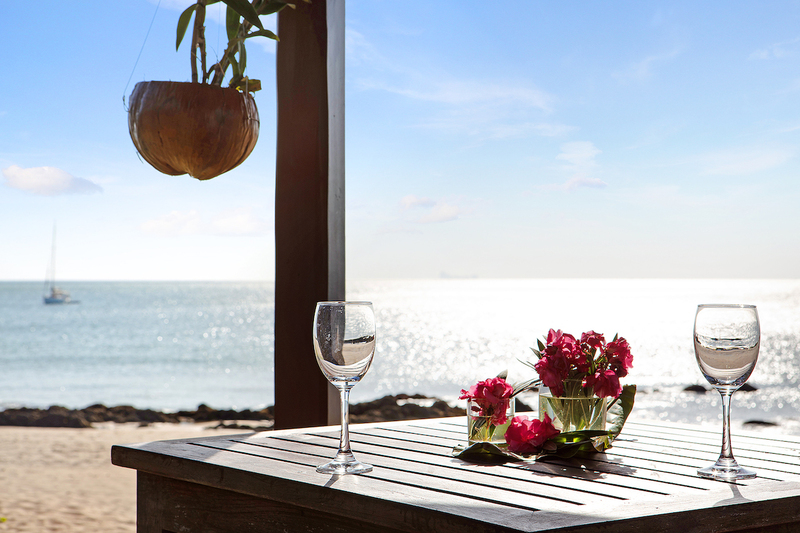 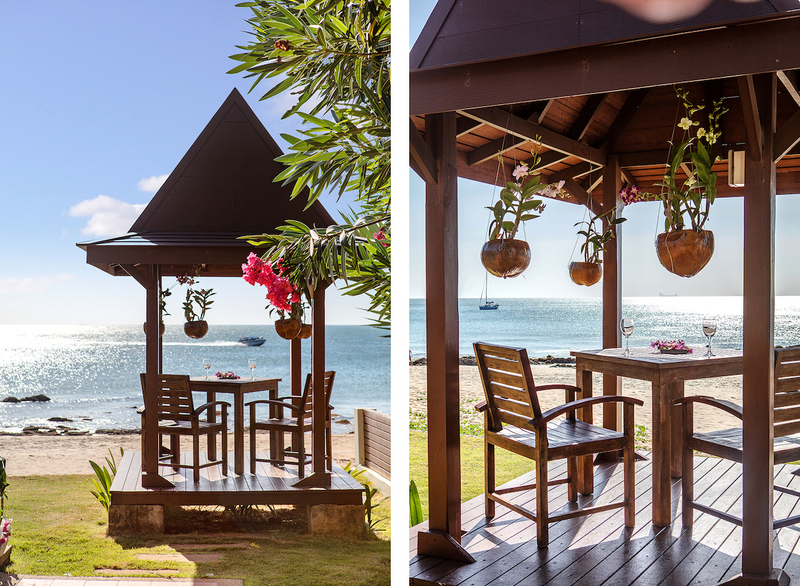 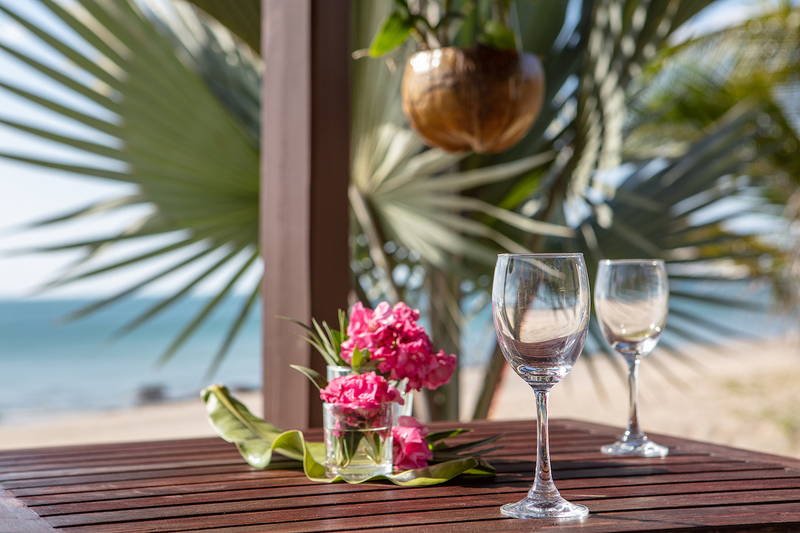 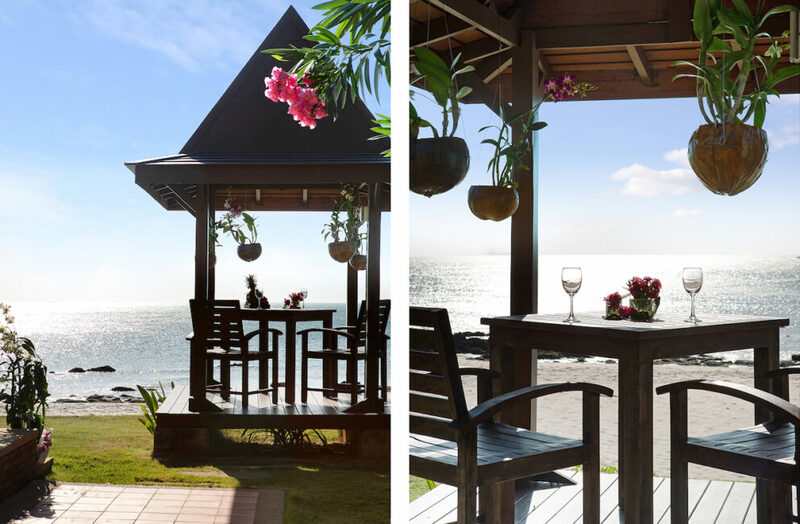 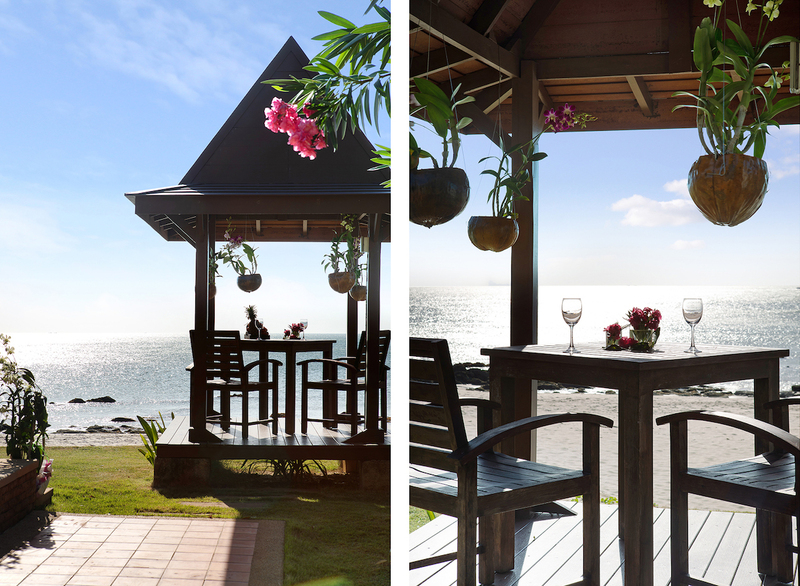 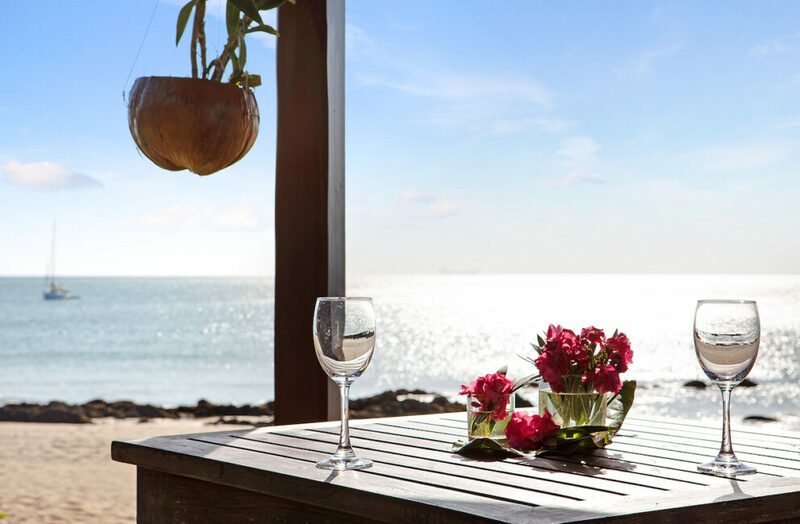 The pavilion, even closer to the beach, is a perfect spot for relaxing and get you closer to the sea. 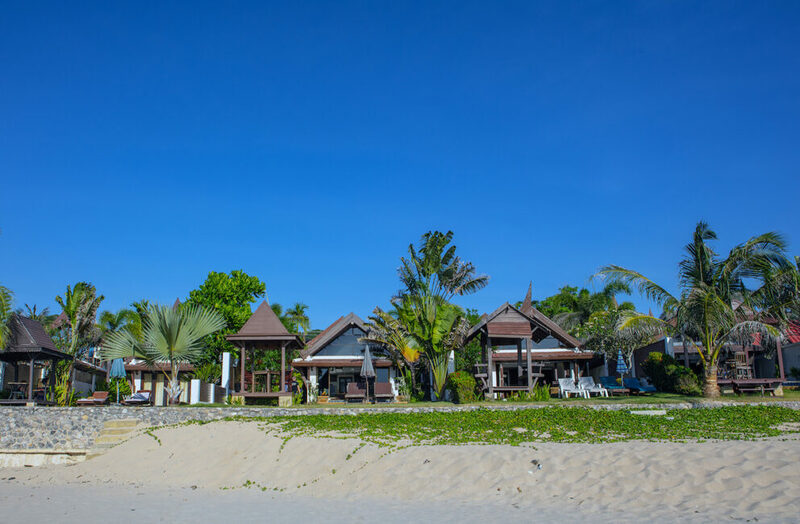 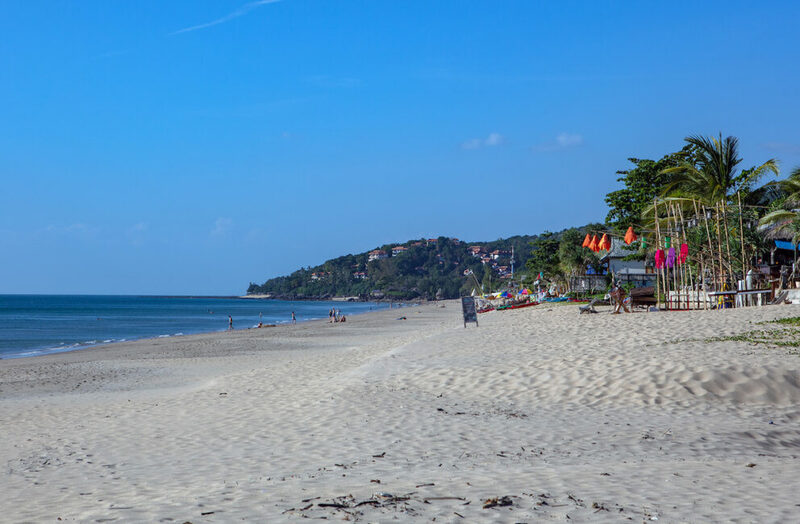 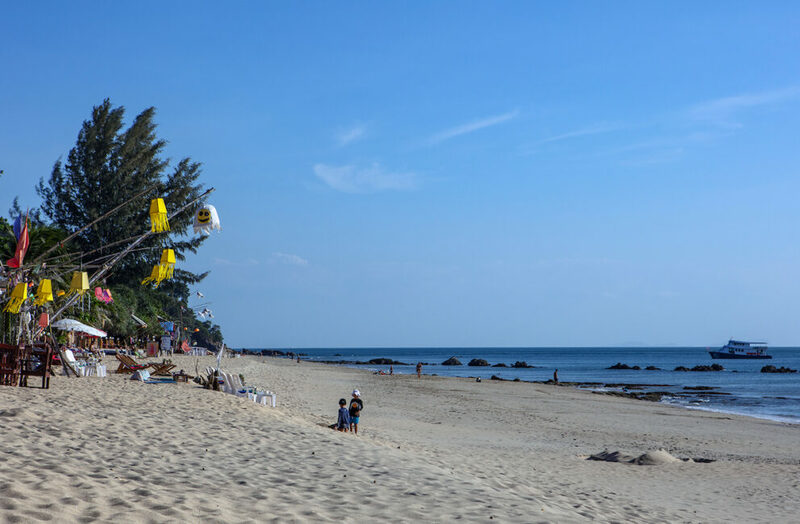 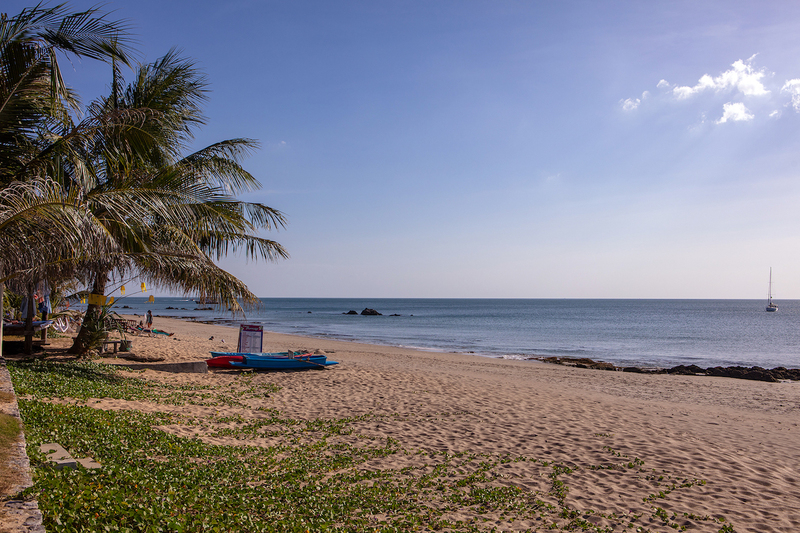 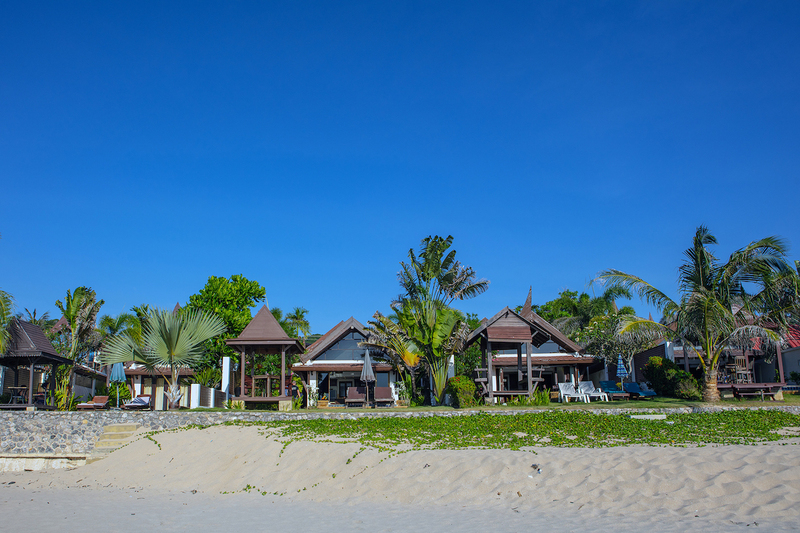 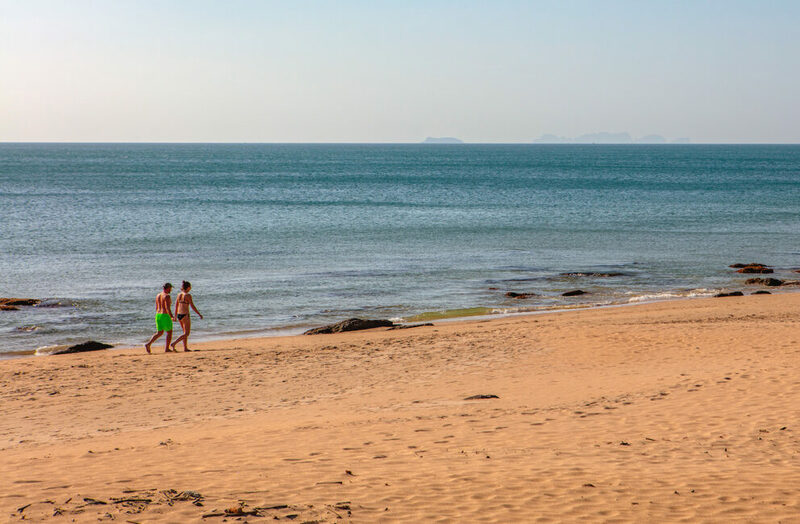 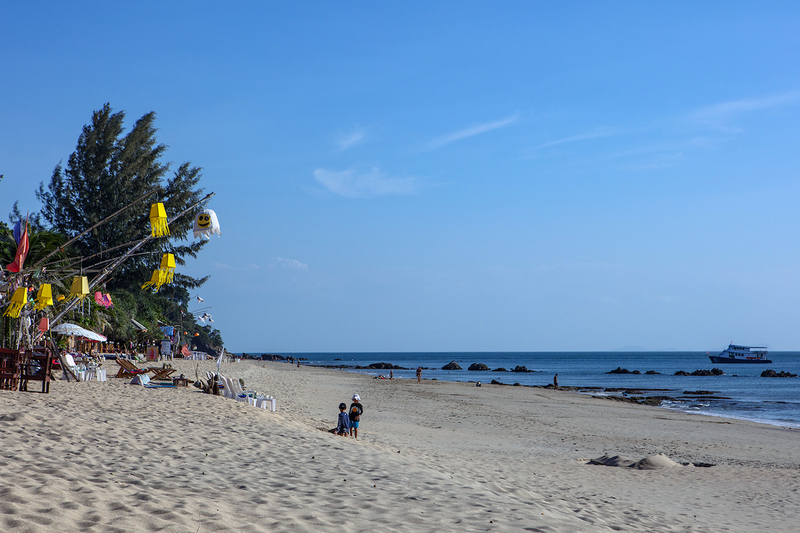 The area around the villa is a beach community, so you can walk along the beach to a variety of restaurants. 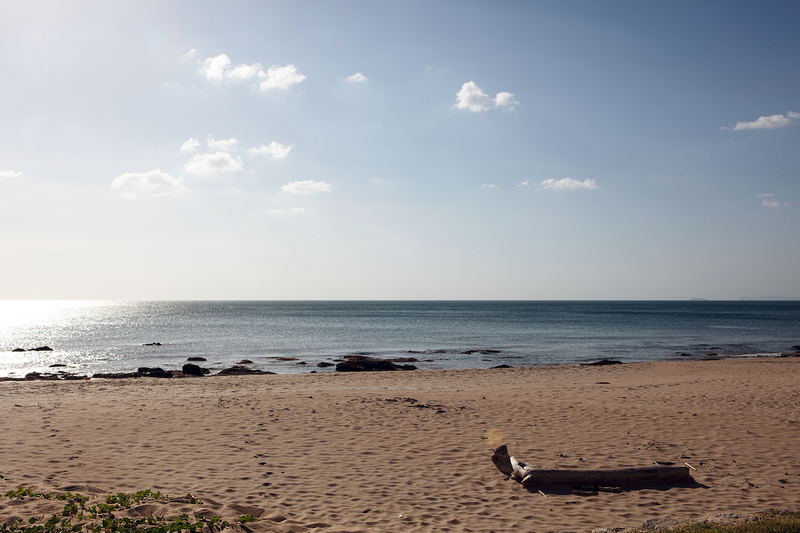 It is beach living with a 5-star accent. 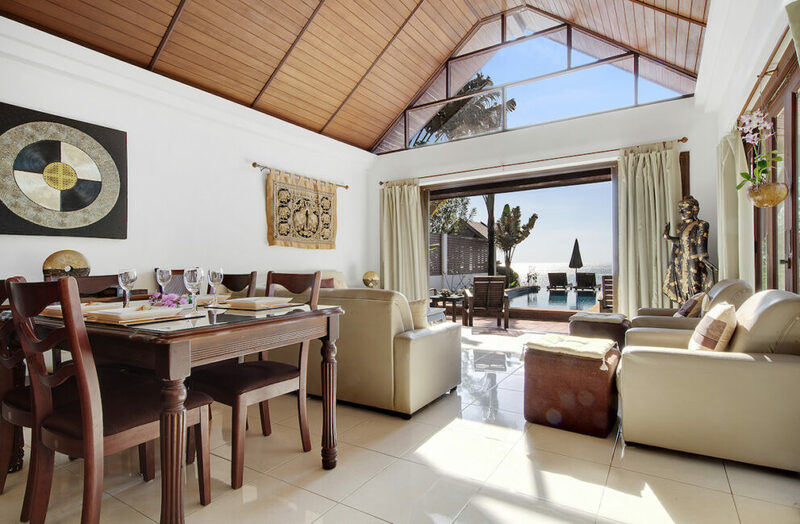 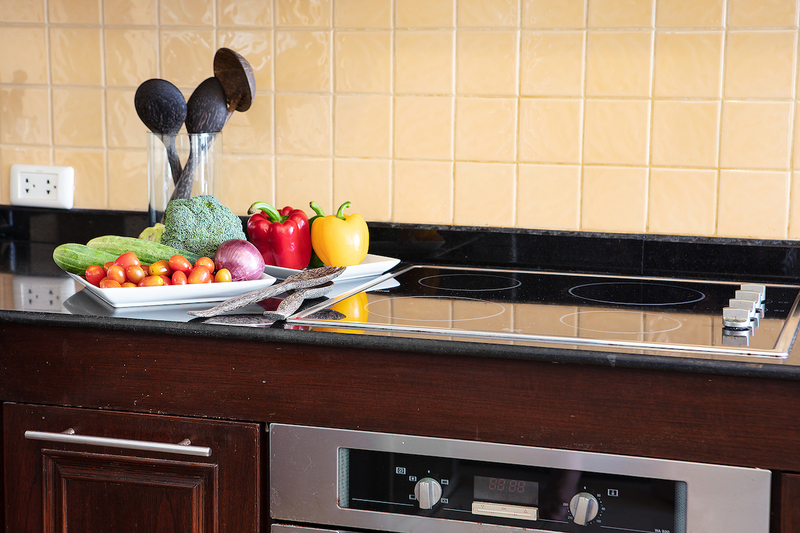 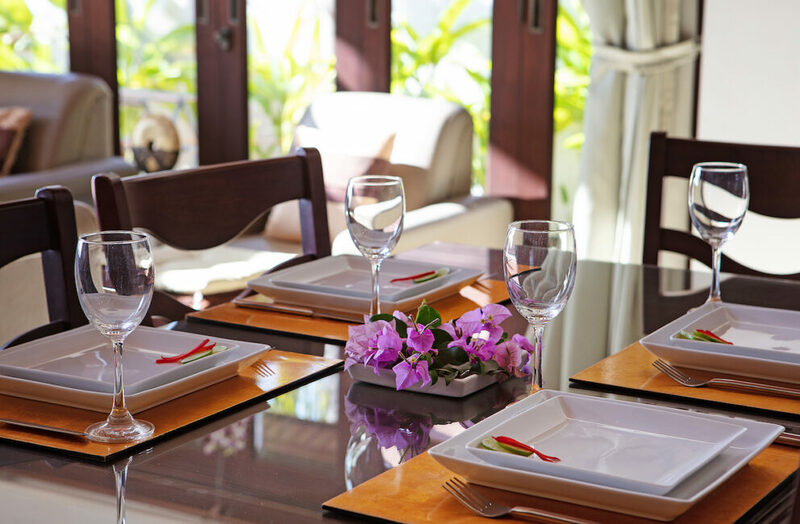 You can also have your meals delivered from nearby restaurants, or hire a private chef to come and cook in the villa for your dining pleasure. 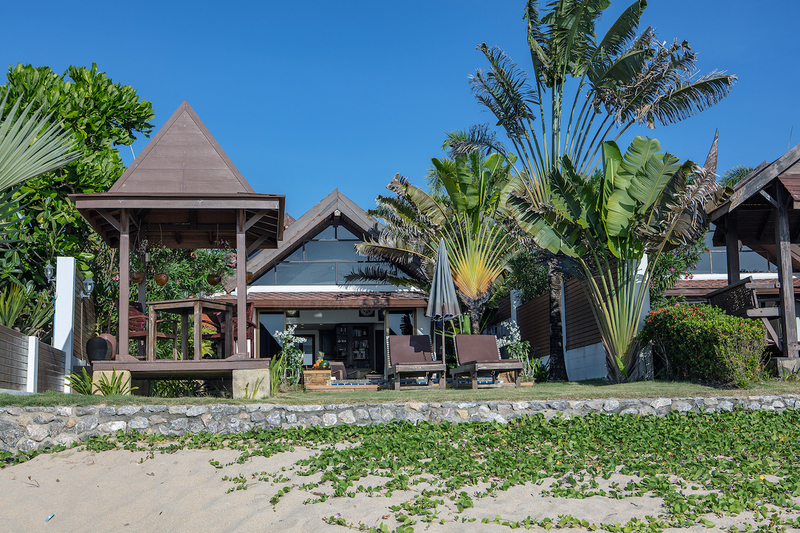 Cok Kai restaurant is a landmark to describe the location. Highlight the check-in date in the calendar in the left column, and use arrow if needed, to find the check out day. 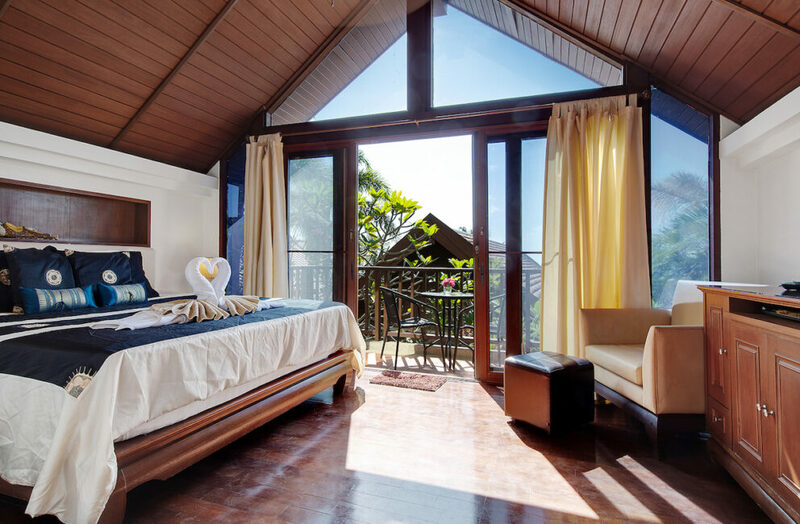 Once both dates are highlighted, the rent is displayed for your chosen stay in order to convenient fit your budget planning. 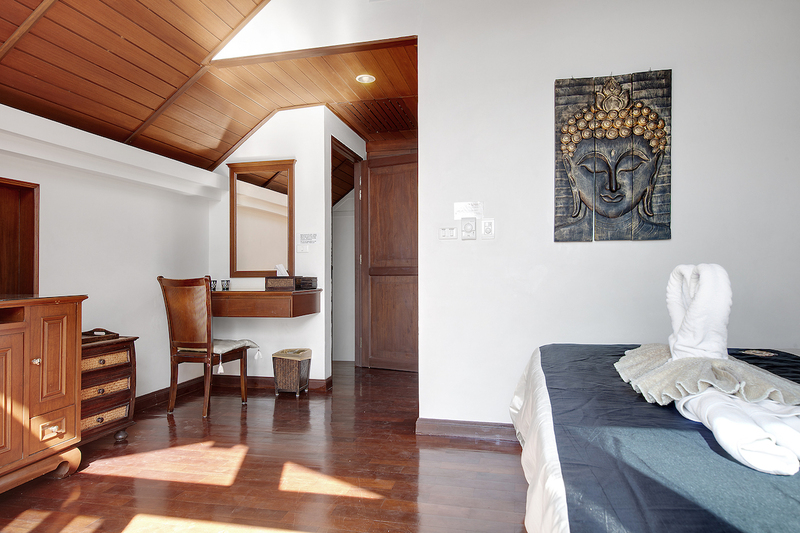 Long stay reservations from 28 nights or more will be discounted as per details in the Booking Confirmation. 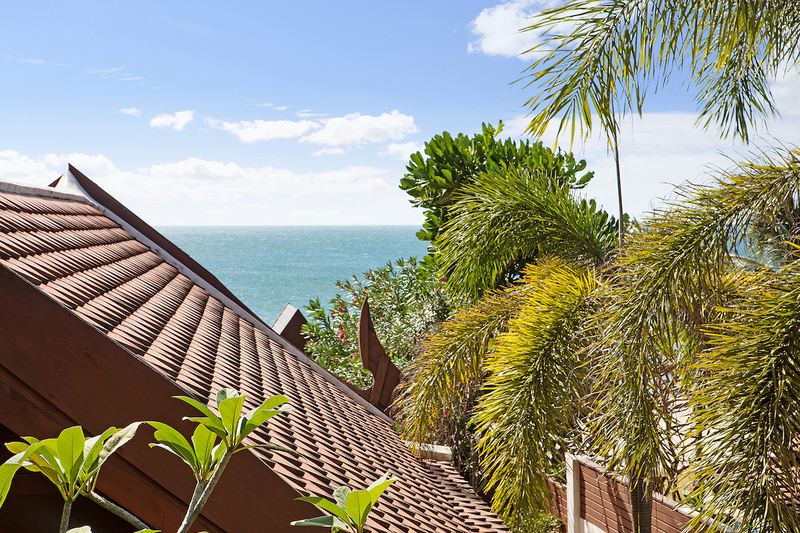 A service fee of 3800 THB will be added to the final payment for each booking. 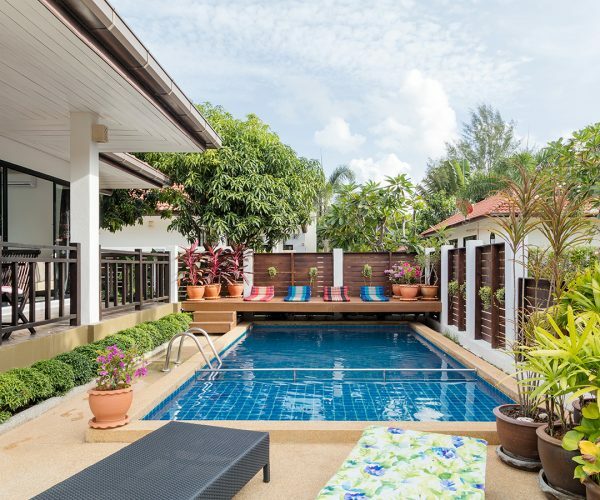 A Safety Deposit plus an estimate for use of water and electricity of 1500 THB per week will be pre-paid in cash at check-in. 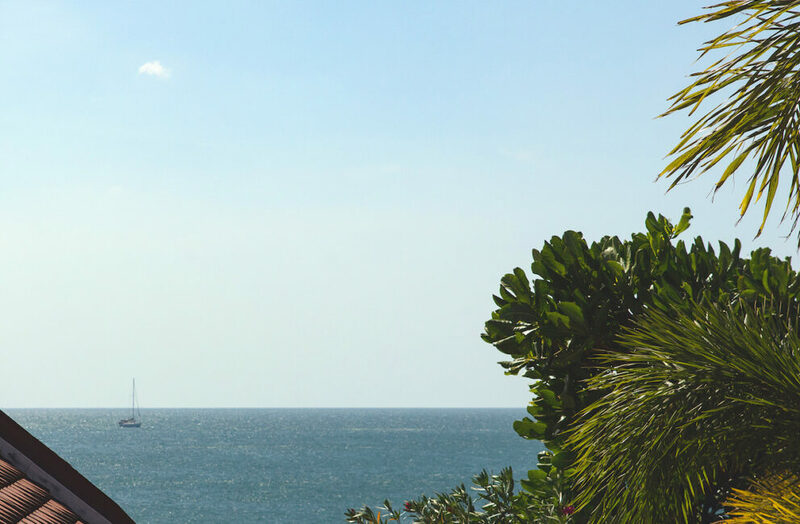 The actual cost is balanced at check out.